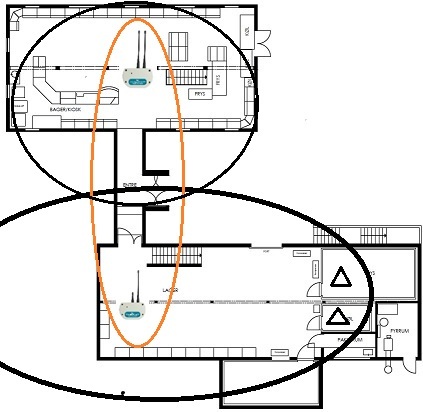 Place the Main Module as central as possibel in the middle of a radius from where the sensors are placed. It is OK to place the module on the top of a refrigiator, that will be a good ground for the module. A Shoop with storage room and closed coolingrooms The triangel mark in the coolingrooms is our suggestion for the placement of sensors. The main module is placed in the storage room, and the Repeater module is placed in the Shoop room. We have placed the main module right in a line with the door opening into the backroom, becaurse we have sensors placed in the coolingrooms in the back. 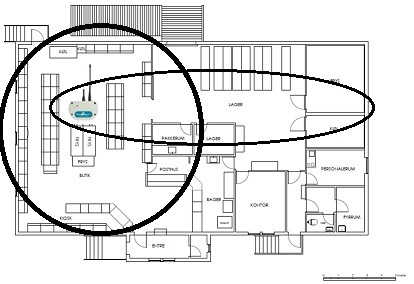 There is not more than 40m from the coolingroom to the mainmodule, so that should bee OK, if there is trouble with reading the signals from the coolingroom then you can setup a sensor with long antenna in the cooling room and pull out the antenna from the room.